Nepal has always struck me as a majestic and mysterious kind of place, full of wonder. With the awesome Himalayas, Mount Everest and its serene people. There are some deaf connections with the UK. Deafway have a project there, and a few years ago the BDA gave the Nepalese Deaf Association some money after the devastating earthquake they experienced. The WFD Board meeting was made up of 4 days of committee meetings and 3 and a half days of Board business with an extensive agenda. Each of the ten Committees reported back and we discussed the way forward with each. The WFD 4-year action plan was discussed. It is now 2 years into the current term and a review of our targets and objectives is now underway. We have accomplished a lot but there is more to be done. Human Rights is a major part of the remit but with new HRO’s working in Arab regions and elsewhere, things are looking up. WFD is working very closely with IDA (the Internationals Disability Alliance) and a unique new project is in the pipeline for 2017 for work in Africa, Asia Pacific, and hopefully other developing countries. Inclusive education is the main issue in the political world of Disability. What do we mean by inclusion? How will it succeed? You can read a statement written by Elena Down, the WFD Human Rights Officer, here. The WFD has now produced a Position Statement on the Language Rights of Deaf children which is now on the BDA website. We have translated this important document into BSL ready for the AGM this weekend. It is also on the WFD website with International Sign. We had Skype meetings with the organizer of the WFD Conference – Budapest 2017 and also the WFD Congress – Paris 2019. The websites will be up and running soon. Abstracts for the various sessions are now being welcomed by the Budapest Conference Committee 3rd International Conference of the World Federation of the Deaf 8 – 10 November 2017 – Budapest, Hungary. See the website here. 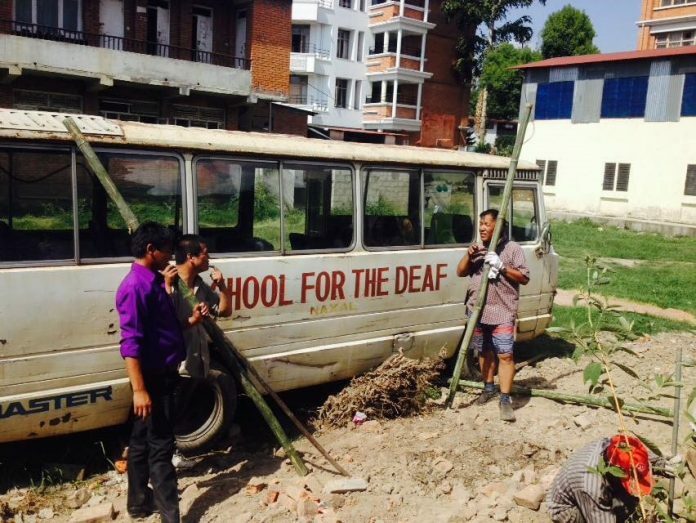 The highlight for many of us was a visit to the deaf school which had been devastated by the earthquake. Some of the school class rooms are still out of bounds on the grounds of safety. Some of the buildings were completely torn apart and are still in danger of collapsing further. Over 200 children attend the school, many of them boarding as they tend to live in rural areas which are impossible to travel to and from with the roads as they are. As with all schools they cover the National Curriculum and the WFD group were split into four small groups to tour the school and have a peek at the classroom lessons. The age ranges are from 3-4 to 15-16 depending on their academic needs. Some had been in school for some time, others had no real education until coming to the school. But the children all had one thing in common, a desire to learn. Communication at first was a bit hit and miss but after a few minutes with the aid of a large map we were able to introduce ourselves and say where we came from, and it was wonderful seeing how they signed our countries using their own signs. We didn’t want to leave, and the children wanted us to stay but we were on a tight schedule arranged by the head teacher. We had observed that each of the groups had one pupil who came to the front of the class to go over the lesson and it was the same child every time! Just like in my own time when I was wheeled out to do my thing then wheeled back. So no change here then ! Another visit was to the Deaf Association seminar where over 150 attended. We did find ourselves with an unexpected day off as the meeting scheduled for that day with government departments was cancelled. So we managed to get a days sightseeing in. The problem was we had to be up at 3.30 am in the morning for a 2 hour drive to the Himalayas! But it was worth it as a dream of mine was about to come true. I was able to see Mount Everest, which had fascinated me since 1953, the year of the Queens coronation and of Hilary and Tensing conquering the highest mountain in the world. A fitting end to a wonderful and enlightening journey.